Underwriting Services and the New Issues Market integrates practice, theory and evidence from the global underwriting industry to present a comprehensive description and analysis of underwriting practices. 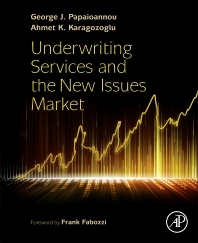 After covering the regulation and mechanics of the underwriting process, it considers economic topics such as underwriting costs and compensation, the pricing of new issues, the stock price and operating performance of issuing firms, the evaluation of new issue decisions, and an analysis of the many choices issuers face in structuring new issues. Unlike other books, it systematically develops a critical perspective about underwriting practices, both in the U.S. and international markets, and with a level of detail unavailable elsewhere and an approach that reveals how financial institutions deliver underwriting services. Underwriting Services and the New Issues Market delivers an innovative and long overdue look at security issuance. Describes and evaluates decisions regarding the features and structure of new security offerings. Regulation of the New Issues Market in the U.S.
George J. Papaioannou is a Distinguished Professor Emeritus at Hofstra University and serves as First Vice Chair on the Board of NEFCU Federal Credit Union. While teaching at Hofstra, he co-founded and co-directed the Center for International Financial Services and Markets at the Zarb School of Business and was one of the founders of the Multinational Finance Society. He has been on the editorial board of the Journal of Financial Services Marketing and currently serves as the North-American Editor of this journal. He was the C. V. Starr Distinguished Professor in Finance and Investment Banking at the Zarb School where he also served as Vice Dean. He has taught courses in investment banking and corporate finance and published in topics including, the listing of securities, capital structure, mergers, and underwriting markets. His research has appeared in Financial Management, Journal of Financial Research, The Financial Review and many other journals. He has presented his work in many academic conventions and has organized conferences and other academic meetings. George Papaioannou holds a B.S. degree from the Economic University of Athens (Greece), a MBA degree from Dusqesne University and a Ph.D. degree from the Pennsylvania State University. Ahmet K. Karagozoglu is the C.V. Starr Distinguished Professor of Finance and Investment Banking at Hofstra University. He serves as the director of Martin B. Greenberg Academic Trading Room at the Zarb School of Business. He teaches courses in computational finance, derivatives markets, financial modeling, quantitative finance and received the Distinguished Teacher of the Year Award in 2009. His research on financial derivatives, risk management, market structure, trading and credit risk has been published in various journals such as the Review of Finance, the Journal of Portfolio Management, the Journal of Futures Markets, International Review of Financial Analysis and the Journal of Fixed Income. He presented his research at numerous national and international academic conventions and delivered keynote speeches at international professional conferences. Ahmet K. Karagozoglu holds a B.S. degree in industrial engineering from Boğaziçi University in Istanbul, Turkey; a MBA degree from the University of Wisconsin, Oshkosh; and a Ph.D. degree in finance from Baruch College of the City University of New York.